HoloLens, Microsoft's futuristic AR helmet, has a bright future bringing mixed reality into the mainstream. But it's not quite the Xbox One VR headset that many gamers are waiting for. With PS VR now out, Microsoft is on the backfoot when it comes to virtual reality - but something is coming, and soon. Microsoft has now confirmed that both its Xbox One S and premium Xbox One X console (previously Project Scorpio) will be brought into the Mixed Reality (previously Windows 10 VR) fold. You can check out our full explanation of Microsoft's mixed reality headsets, then head on for everything we know about its Xbox plans specifically. Microsoft announced its plans for Windows Holographic devices back in 2016, but it's now changed the name to Windows Mixed Reality. It's partnering with a bunch of companies including Acer, Lenovo and Dell to make headsets that can give people a VR experience for less money than the likes of the HTC Vive and Oculus Rift. The headsets contain inside-out tracking, meaning you can walk around in VR without the need for external sensors. But they also have a camera passthrough, which will provide the "mixed" reality in some instances. At the same time it announced the rebranding, Microsoft also confirmed it will bring mixed reality to Xbox One, as well as its 4K Xbox One X console, which is set to release 7 November. Now, it's not yet clear whether this will include all of the mixed reality headsets like Acer's, some, or new, specific headsets. Right now the message is a tad unclear, and Microsoft seems resistant to comment on specifics when it comes to the console stuff - which we'll return to in a moment. What types of things will Mixed Reality do? That's the killer question: what kinds of "Mixed Reality experiences" is Microsoft referring to? We assume you'll have a lot of the normal VR fare - remember that at last year's E3, Bethesda's Todd Howard confirmed that Fallout 4VR would come to Xbox One X. This year we learned that Fallout 4 VR will come to HTC Vive in 2017, but we still don't know when it's coming to Xbox One X. But mixed reality refers to a mixture of virtual and augmented reality, giving Microsoft's headset(s) a unique angle that could open up more compelling experiences where games are brought into your living room. 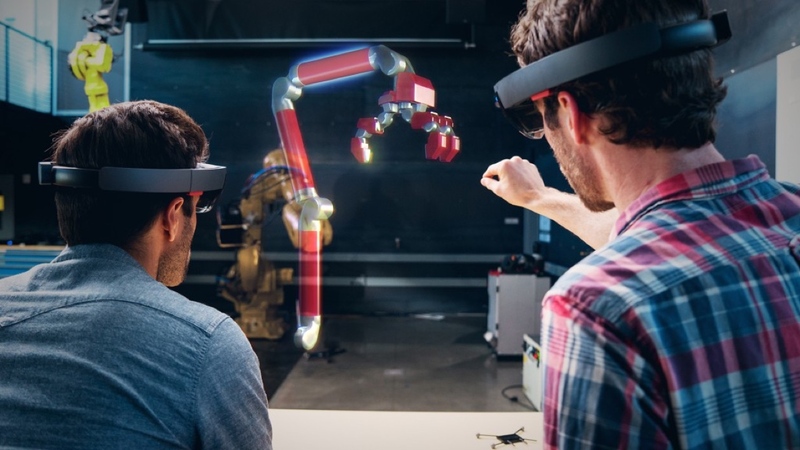 You only need to look at HoloLens to start imagining the possibilities. While still in development, HoloLens has showcased some neat ideas in mixed reality. Remember the Minecraft demo from E3 2015? The mixed reality twist will give Microsoft space to offer experiences on the Xbox One that other consoles don't offer (at least for now). But there's also a question over what Xbox One will support and what Xbox One X will support. In an interview with Stevivor late last year, head of Xbox Phil Spencer said, "We designed Scorpio as a VR-capable console", however he added that he didn't feel like VR was providing the right types of experiences yet. By 2018 that may well have changed, but the augmented reality element gives Microsoft's headset plan another interesting facet. Microsoft's partnership with Oculus - an Xbox One controller is bundled with each headset - led to much speculation that Microsoft could be making the headset work with the Xbox One, and Microsoft refused to deny anything. The announcement of the Mixed Reality initiative suggests it's forging its own path, but we still wouldn't rule anything out in the long run. Microsoft wants to make the barrier to VR lower with more affordable headsets, but nothing's to say it means it won't one day give people the option to run a Rift on the Xbox if they choose to. Or heck, maybe even the Vive too. For now though, it seems like Microsoft is fully committed to its own MR partnerships. We definitely didn't see it at E3 2017, which saw Microsoft completely ignore VR at the briefing in which it unveiled the VR-ready Xbox One X. Alex Kipman, technical fellow at Microsoft, previously told Polygon that, but we held out a little hope regardless. "Our primary focus is making our mixed reality experiences a success on Windows 10 PCs," said Kipman. "We believe that right now a Windows PC is the best platform for mixed reality as its open ecosystem and enormous installed base offer the best opportunity for developers, and Windows offers the most choices for consumers. "Windows has been the birthplace of a variety of technologies, and we believe this will hold for mixed reality too. Given the efforts we have underway on Windows for mixed reality, and our belief that console VR should be wireless, right now we are focused on developing mixed reality experiences for the PC, not on the console." Oh. So what does this mean for Xbox? It's unclear, since Microsoft is being vague on how Xbox VR is going to play out. For instance, when asked about VR support for the Xbox One X, the company told Kotaku that it thinks "PC is the right place to be playing with VR right now." By now you should know that Sony has its own virtual reality headset for the PS4. PlayStation VR has been on the market for a few months now, and sales are good at almost one million in four months. However it's purely VR, which is why Microsoft may have an edge with its "mixed reality" angle, assuming it turns out to be a compelling user experience. As for Nintendo, its just-launched Switch console has no headset at all, but there's still time for Switch VR. The company has confirmed it's looking into the possibility of introducing a VR element to the console, but is working around comfort problems. Surfaced patents suggest you would take the Switch's tablet and slot it into a headset, Gear VR style. So Microsoft's proposition for a console headset has the potential to be quite different to its rivals. Let's hope it delivers.